Here is the Asset General window and a generic computer asset in Fabrikam Ltd.
I’ve highlighted two fields here: Asset ID and Asset Label. The Asset ID is the primary identifier for the asset itself, much like a GL Account Number, Customer ID, Vendor ID etc. Once you create an Asset ID, the field is greyed out and not editable (without a tool like one of the Modifiers built into GP or through PSTL*, or an ISV product like Changer that has modifiers for some modules). 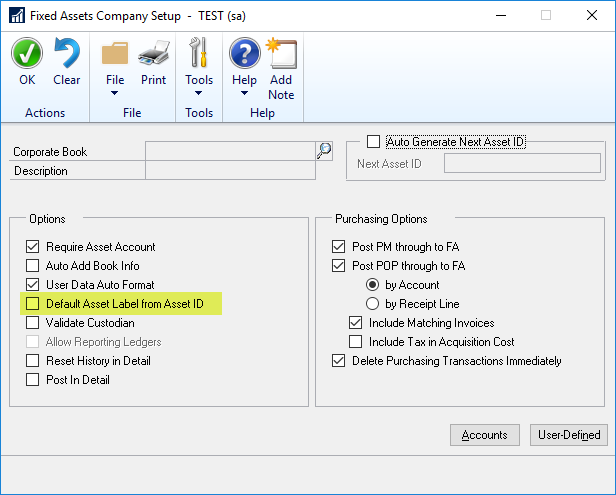 The Asset Label is a text field which is not locked, and is blank by default (unless “Default Asset Label from Asset ID” is marked in Fixed Assets Company Setup, per the picture below). 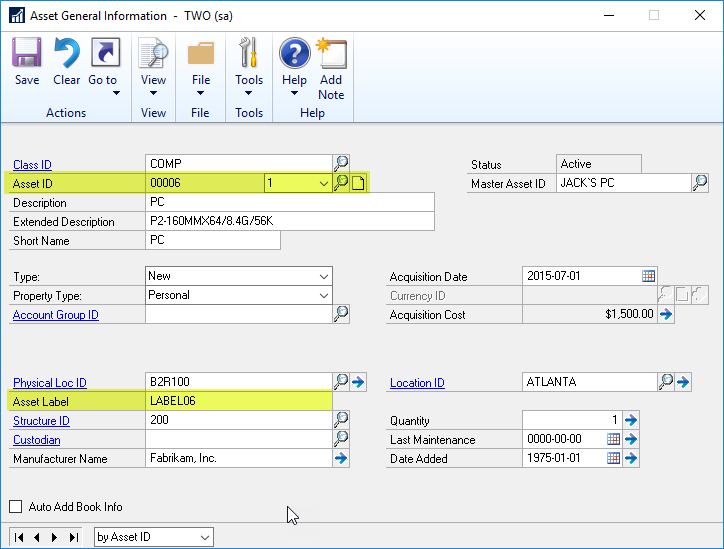 The intent of the Asset Label field is it might literally hold the value of the Asset tag/label physically assigned to an asset, like a computer might have in your organization. My recommendation has always been to use the Asset Label field to track what physical label value is attached to an asset, as opposed to using the Fixed Asset ID (even if you choose to use the FA ID itself as the “Asset Label”). Here are some reasons why. Asset ID naming conventions should be driven by Finance/Accounting in my opinion. The naming and patterns of naming should not be dictated by another department’s asset labelling needs. Most times, the number of assets that need labelling physically are only a subset of the overall Assets being tracked in the Fixed Asset module. Utilizing a different naming convention for one set of things because another department has a label requirement doesn’t make sense. The flip side of that is the Asset Label/Tagging should not be driven by Finance/Accounting! What the IT department chooses to label a computer with should not be decided by what Finance decides to number the Asset ID. If you can come to agreement and use the same value, great, but I don’t recommend even trying. Do your own thing but you do then need to coordinate your processes around adding and disposing of assets to ensure the Asset IDs are matched appropriately to the Asset Labels being used, and updated when Asset Labels change. Example: in my company, computers are labelled with a naming convention that happens to include the operating system (W7 vs W10 in the name for instance). We’re in the middle of upgrades to Windows 10 and some machines will simply get upgraded, instead of a brand new computer being issued, which means the Asset Label & machine name will change, but from a Finance perspective, it’s the same Asset ID. Does changing the ID make sense in a situation like this? Not really, but tracking the list of computers by serial number and a process where IT informs Finance of which computers have label changes does make sense. Another example: in other companies, asset labels might also contain a reference to the user or custodian of that object. However, personnel changes, assets get moved around between users so labelling changes when that occurs. I personally wouldn’t recommend labelling a machine (or machine name) with the custodian because users change, however I know it’s fairly common to do that (and my company does that too). Hybrid suggestion: if you want to use Asset IDs for Asset Labels, I would highly recommend marking the box indicated above in Company Setup to default (fill) the Asset Label field with the Asset ID and *reference that field* as the field that ties to the asset label/tag. Down the road if reasons cause you to change the ID naming convention or the labelling, then you have options o separate the two things to their own values, even though most labels defaulted in from the ID itself. 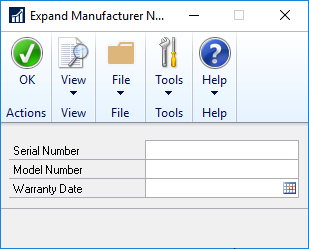 I should also add that there are already other fields to track serial numbers of assets (under the arrow beside Manufacturer) so I’m specifically not talking about those here. Generally speaking, if there is an out of the box field intended to track a certain type of thing, like Serial Number or Model Number, I use it instead of hijacking another field for that purpose. *PSTL = Professional Services Tools Library. This used to be a bunch of random tools that the Professional Services side of the GP team used to be for sale individually or used for addressing specific issues. At some point they were bundled into a library of tools and at a later point (10 years ago or so? ), they were offered for free via PartnerSource download. Well, that’s it for this post, which really was just discussion points around why you may or may not want to use Asset IDs for physical Asset Labels (if you’re using Fixed Assets in Dynamics GP).